I have a confession to make: I’m obsessed with feta cheese. Growing up, my mom used to make spanakopita, (carefully wrapped phillo dough triangles stuffed with spinach and feta), every year for my birthday – it was my favorite thing and that tangy creamy flavor is still one of my fondest food memories. Of course, that’s a lot of work to do for every day meals, so nowadays I get my feta fix on salads. 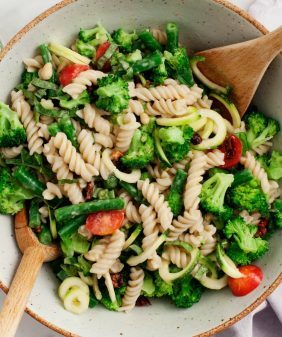 That tangy salty bite has a way of turning on-hand ingredients into tasty cohesive meals. Sweet potato and pomegranate, watermelon and avocado, strawberries and quinoa, check check check. One ingredient we happened to have on-hand recently was stale pita bread. I’ve made plenty of panzanella salads with stale bread, but I just love fattoush and all of its crispy flatbread goodness. Fattoush is a middle eastern bread salad made with toasted day-old pita, tomatoes, cucumbers, feta and sumac. Sumac turned out to be a difficult ingredient to source so I subbed in some spicy & smoky (dried) harissa instead. So here we have: fattoush-ish. In a small bowl drizzle sliced sweet cherry tomatoes with a little bit of sherry vinegar, olive oil, salt and pepper. (This becomes so flavorful and juicy that making a separate salad dressing isn’t necessary). Cut up the stale pita into small chips, drizzle it with olive oil, harissa spice and salt, and toss it in the oven until it’s golden brown and toasty. Set them aside and try not to eat them all as you assemble the rest of the salad. (or if you have snack-y family members like I do – toast some extra pita so you’ll have plenty left for the salad). Toss the whole thing with peppery arugula, crispy chopped cucumbers and feta cheese. Toss it all together so the juices of the tomato soak into the toasty pita. Sprinkle on more harissa, a few mint leaves, and – of course – serve with extra feta. Slice pitas into 1 inch pieces. Toss with 1 teaspoon olive oil, salt, pepper, and dried harissa spice. Bake in the oven until golden brown and toasted, about 10-15 minutes. 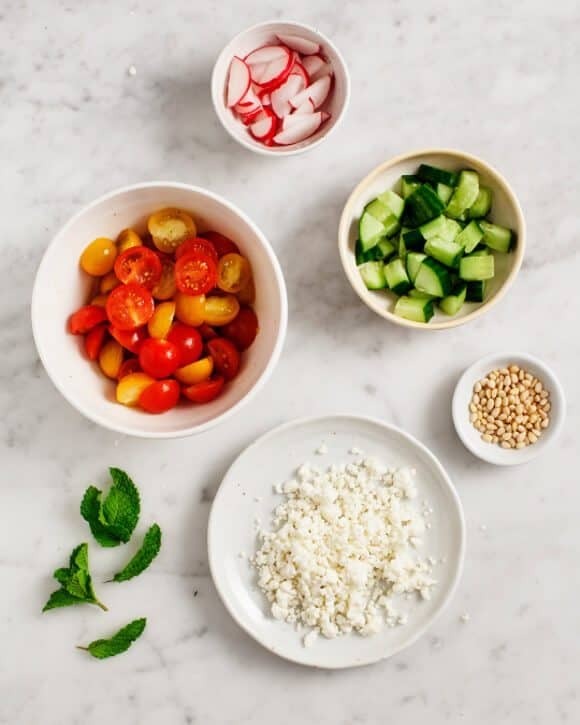 Place sliced tomatoes in a small bowl along with a drizzle of olive oil, sherry vinegar (about ½ tablespoon each), and a generous amount of salt and pepper. Let this sit at room temp for about 20 minutes, while you assemble the other ingredients. Assemble the salad with arugula, diced cucumber, sliced radishes, pickled onions, feta cheese, tomatoes, toasted pita, pine nuts and mint. Add more harissa to taste. *Quick pickled onions: thinly slice onion and place in a small jar. Cover with white wine vinegar and a few pinches of cane sugar and salt. Chill for at least 1 hour or overnight. Store any extra in the fridge, they'll be good for at least a few weeks. (I use the Whole Foods brand bottled Harissa spice). Assemble the salad with arugula, diced cucumber, sliced radishes, pickled onions, feta cheeses, tomatoes, toasted pita, pine nuts and mint. Add more harissa to taste. i love feta too and only last night i made gazpacho you posted from yellow table with feta – so freaking delicious. 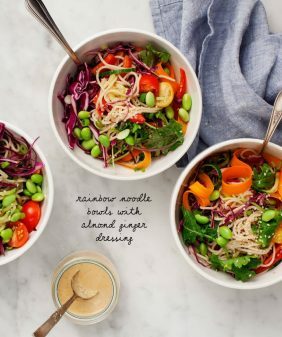 i cant wait to try this salad as well. 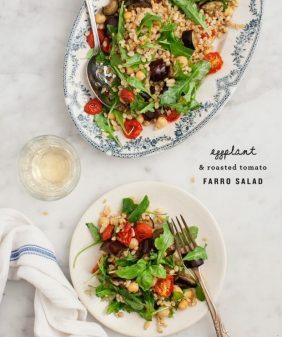 I love fattoush too, and I make Ottolenghi’s version often. But I love your spin with harissa – it’s a favorite flavor enhancer in our house- and feta! This salad looks so delicious. Such a great idea to use the leftover pita bread! I bet that added a great crunch to the salad. This looks so yummy! I made a Fattoush a couple days ago that I can’t stop thinking about… I love the idea of adding feta. And pickled red onions!!! YUM. yes yes yes – I too am obsessed with feta cheese. What good Greek girl wouldn’t be? Such a great salad, I love this. 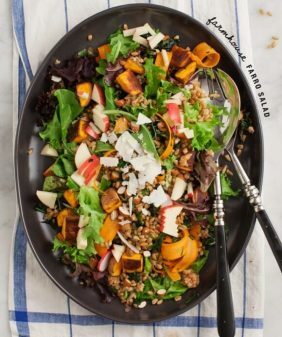 I made this salad and ate it for three lunches and it was the best thing I ever had. I used halloumi instead because it’s ym favorite cheese and it was phenomenal! ha, so glad you liked it! Made this last night and it was absolutely delicious… I tossed the pita slices with some za’atar (instead of harissa) and olive oil, and it turned out great! 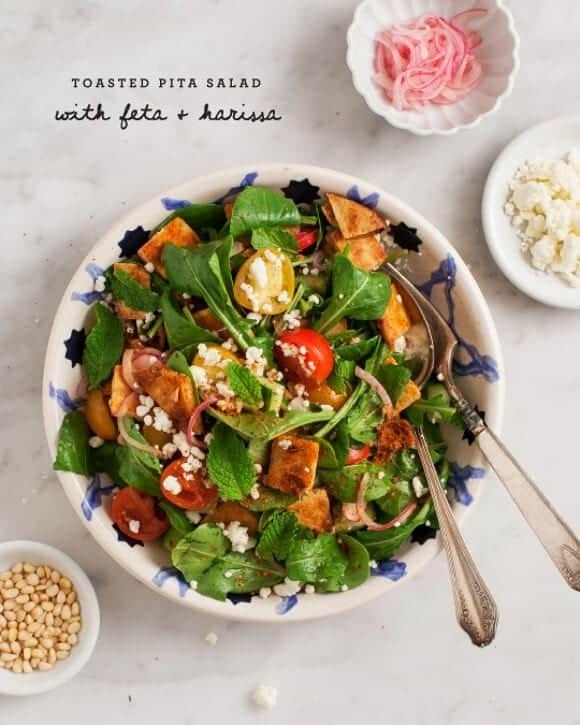 I love this fattoush-ish dish, will give this a go soon! I like the real salty creamy style feta, so addictive! I’ve never met a salad that wasn’t improved by a healthy sprinkling of feta over the top, you can definitely sign me up to the fan club! Love this salad! I also love spanakopita but you’re right-tons of effort! 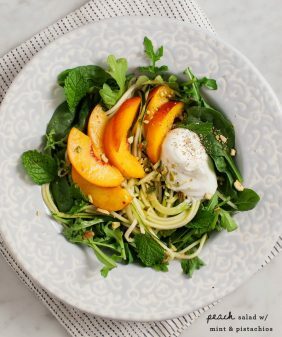 This salad has all of my favorite things and is perfect for summer dinners. 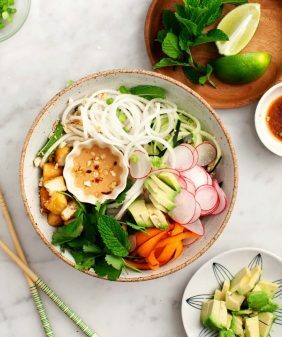 This salad looks beautiful! And I’m obsessed with harissa lately. Gonna have to try it out! This looks amazing Jeanine! I love fattoush! What is harissa? I often add ground sumac to my Greek dishes (they use it often in Fatoosh salads), does harissa have sumac in it? it’s a north african spice mix (which is why i called this fattoush-ish). You can use sumac here if that’s what you have on hand – it would be more traditional. If you seek out harissa (it’s good on many things), it comes as a paste or a dried spice (I find it at whole foods). Thank you so much! I will look for it!